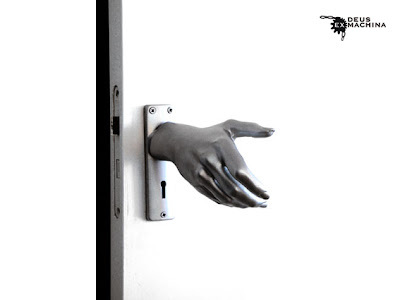 Tonight there was a lot of talk about ghosts and whatnot, and I have a love/hate relationship for this door "hand-le" by Dutch designer Naomi Thellier de Poncheville. As much as they are cool, I don't know if I would enjoy waking up in the middle of the night and grabbing for a cold dead-like hand. The thought of twisting it similar to my mirror-like double-jointedness, helping me out the door and on my way is rather discomforting. I think they are brilliant, but maybe if I was in a different state of mind, other than this spooky evening! 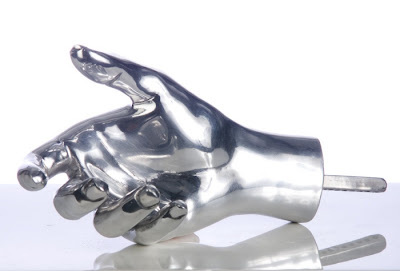 But, if I was totally into these (which I think I am) and redesign a little for change - to step it up a creepy, but awesome notch - I would get other family members to make hand molds to represent each bedroom with their personal fingerprints to boot! :D Love! oh! i have always loved this door handle! i think it would be awesome for a front door!... word for sure creep out the creepers!